Residents of Sandy Bay on Wednesday held a thanksgiving service to commemorate the first anniversary since that community was adversely affected by the passage of a trough system on November 29, 2016. The event was organized by the Sandy Bay Primary School, where 90 residents of the area were housed for about three months after their homes were damaged by flood waters. Songs of praise and worship were sung and prayers offered for the community and children who were affected. Several grade six pupils read verses from the Bible, while the schoolâs teachers did a rendition of âThank you, Lord, for one more yearâ and the school choir also gave an outstanding performance. 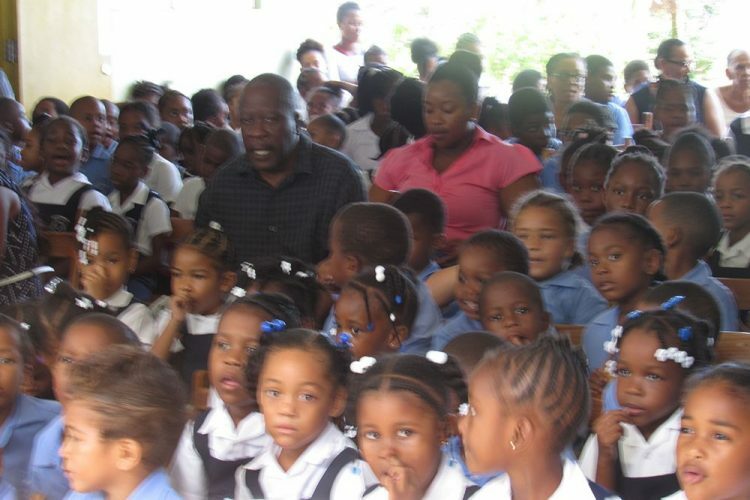 Bishop Melford Pompeyâs exhortation was based on Psalms 108.
âEven though some Caribbean islands suffered and are still without some of the basic needs of their lives, Godâs mercy is still with them and while we enjoy some of these things that they cannot enjoy, Godâs mercy is still with us. âWhen trials come, when temptations come, when it seems no one cares, or our friends are against us â there is still the mercy of God. It is important when we look back at November 2016, we do not know what tomorrow holds for us, but one thing we do know â who holds tomorrow…in everything. Give thanks and put God first, for his grace is an amazing grace,â Pompey said. Hepcie Roberts, headteacher of the Sandy Bay Primary School, in her remarks said the school term was interrupted from November to January, as the school was used as an emergency shelter. âWe are just grateful for sparing mercies and just wanted to give God thanks,â Roberts said. Owen Baptiste, disaster co-ordinator for North Windward, said about 90 people were in the shelter on the first day, with the numbers swelling to 197 over time. This figure, he said, included those housed for a brief time at the Sandy Bay Seventh-Day Adventist Church. The disaster co-ordinator said several homes were flooded with minor damage, while eight houses were totally destroyed and five partially damaged. He said the agricultural sector also suffered severely, as farmers lost livestock, crops and land.